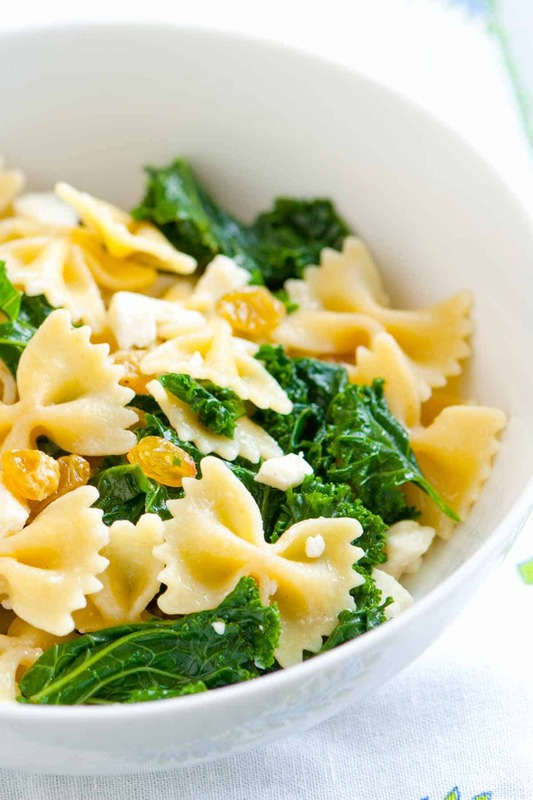 How to make brown butter kale pasta with feta cheese and golden raisins. 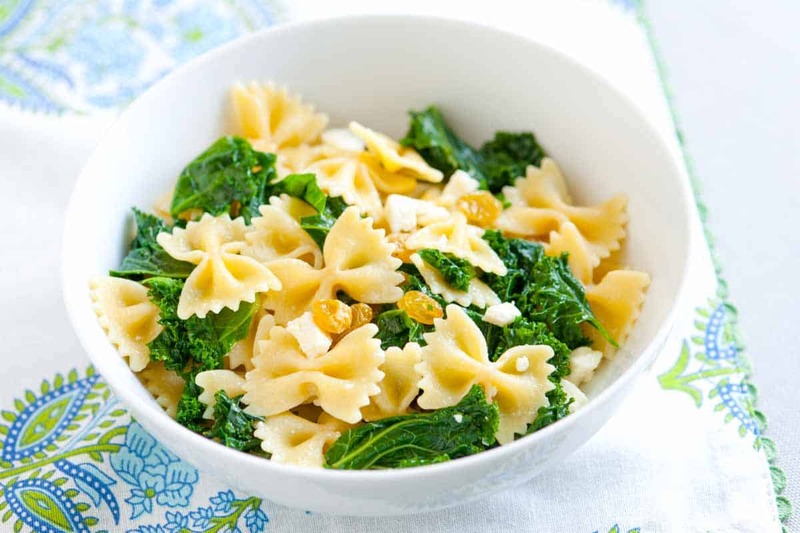 Jump to the Brown Butter Kale Pasta Recipe or read on to see our tips for making it. This comes together very quickly and is perfect for busy nights. Thanks to brown butter, the pasta tastes nutty, there’s crunch from wilted kale, briny feta cheese, and a little sweetness from raisins. 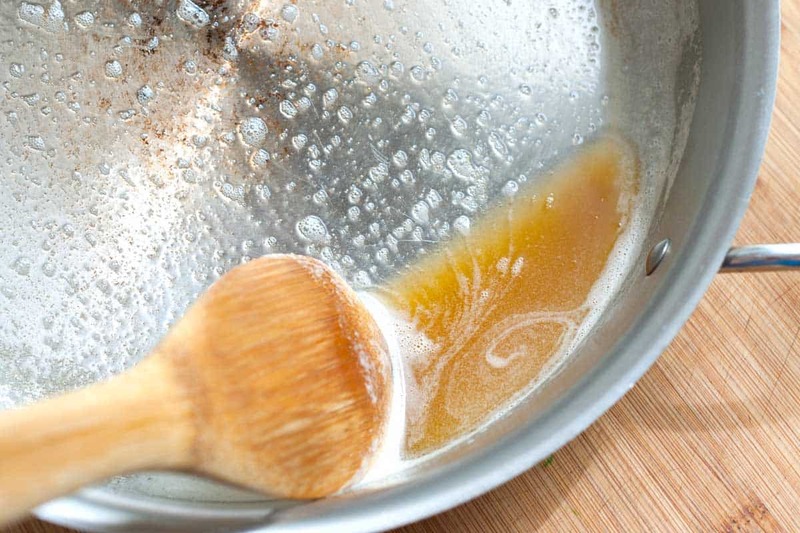 YOU MAY ALSO LIKE: How to make brown butter perfectly every time. Brown butter is magical and tastes toasted and nutty. 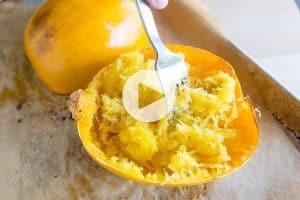 Use it in both sweet and savory dishes. Jump to the Brown Butter Recipe. I love this recipe. In the time it takes to boil and cook the pasta, everything will be done. I know the raisins might sound a little strange for pasta, but trust me. Brown butter + feta + golden raisins is awesome. As the pasta cooks, we get everything else ready. First, plump up the raisins. To do this, simply pour hot water on top of them and let them sit for a few minutes. Next, make the brown butter. It’s easy and only takes 5 minutes to do. Basically, you swirl butter in a pan over medium-low heat until the butter solids toast and turn brown. As this happens the butter becomes nutty. 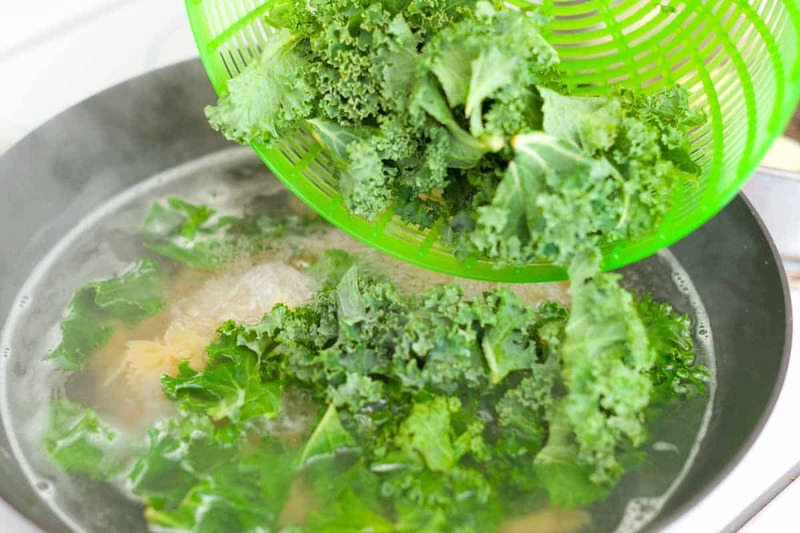 Finally, just before the pasta is finished cooking, throw a bunch of kale into the pot with pasta. After just a few minutes, the kale will be wilted and perfectly cooked for the pasta. For more crave-worthy kale recipes try our Kale and Bean Salad with Tahini Dressing and Walnuts, these Easy Homemade Kale Chips or this recipe for Braised Kale, Bacon and Egg on Toast (it’s utterly delicious). In the time it takes to boil and cook the pasta, everything will be done. I know the raisins might sound a little strange for pasta, but trust me. Brown butter + feta + golden raisins is awesome. Bring a large pot of salted water to the boil, add pasta then cook according to package directions. When there are 3 minutes left until the pasta is done, add the kale. Drain. Meanwhile, add raisins to a small bowl then cover with boiling water and set aside until pasta has cooked. Drain the raisins then add to the brown butter as well as the pasta and kale. Toss well, taste then season with salt and/or pepper as needed. 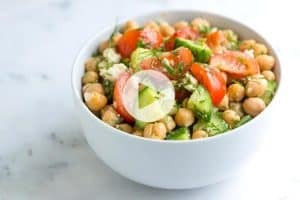 Serve with feta cheese scattered on top. I make something similar – kale with raisins and pine nuts and a splash of balsamic. i added your pasta and feta. Now it’s over the top! Thanks so much 🙂 Love your take on the pasta, too! I’ve made this recipe several times. I again made kale and pasta this past week-end but added cannellini beans and left out the raisins and used grated parmesean. Mmmmm mmmm. I made this with rainbow chard. I like it better with the cahrd, very good! You had me at brown butter! YUM! 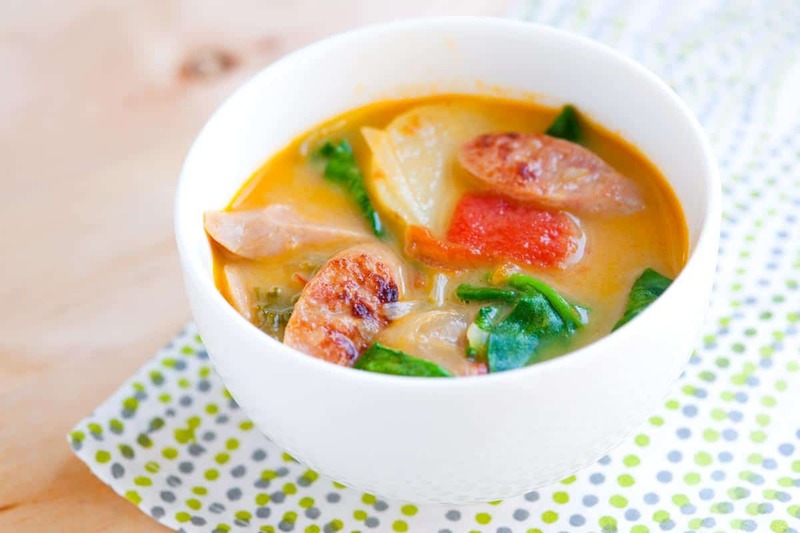 Looking fantastic, i can’t stop myself to eat this dish, thanks for share this wonderful recipe !! Sure! Chicken or fish would be great! Awesome! Bc I have all the ingredients in my fridge already! 🙂 Can’t wait! Thank you!! This looks delicious. I very much like pasta recipes with a lot of vegetables in and a creative aspect. I find all of it in this recipe.